Greetings everyone! I’ve been looking forward to this moment for a long time now. After a year of development work, I am very excited to announce that Thundra is taking flight out of beta. We are now officially GA! I first started Thundra simply as a side project meant to help us figure out what was going on in our OpsGenie serverless application. None of the existing tools and technologies out there gave us the visibility we needed. I continued to work on the Thundra technology and our OpsGenie CEO, Berkay, started asking why I was spending so much time and effort on Thundra. Together, we came to realize that with Thundra we could help out many more serverless application teams than just our team at OpsGenie. Building applications using a serverless architecture is still a relatively new approach. As a developer, I love serverless because it is so easy to simply write code and execute it. I don’t need to provision a server and operating system, make sure the networking is set up, configure everything, or go beg the IT team to do all this for me. I don’t need to write code that manages the infrastructure. I can just write code that adds immediate value to the business and application. I believe this approach is quickly going to become a standard option (alongside traditional and container approaches) when making architectural design decisions. And a lot of others out there seem to agree with me. However, best practices are still being developed and there isn’t a robust ecosystem of tools and technologies that developers and operations teams can draw upon. This is where Thundra and other technologies that support serverless development and deployment can help. We built Thundra from the ground up to be a perfect fit for serverless environments so you can solve your serverless questions as quickly as possible - letting you get back to coding. To achieve this, we focused on two priorities. We made Thundra very lightweight to minimize any resource consumption and disruption to your AWS Lambda environment.. Second, almost all aspects of Thundra are customizable and configurable according to use cases. We also felt it was important to give you the most implementation flexibility possible. With Thundra we make it easy to gather both at-a-glance, high level system information as well as deeply detailed information you need to precisely identify where your serverless problems are - quickly. Thundra gives you zero code and low code options for instrumenting functions and zero overhead options for monitoring your data. With this flexibility, you can collect all your data without interrupting, burdening, or slowing down your Lambda applications. When it come to analyzing your data, we felt it was important to have all your logs, metrics, and traces in a single location. You may analyze it within Thundra’s Web Console or in another platform via our integrations. We will be continuing to add integrations - feel free to let us know where you want to see your serverless monitoring data! 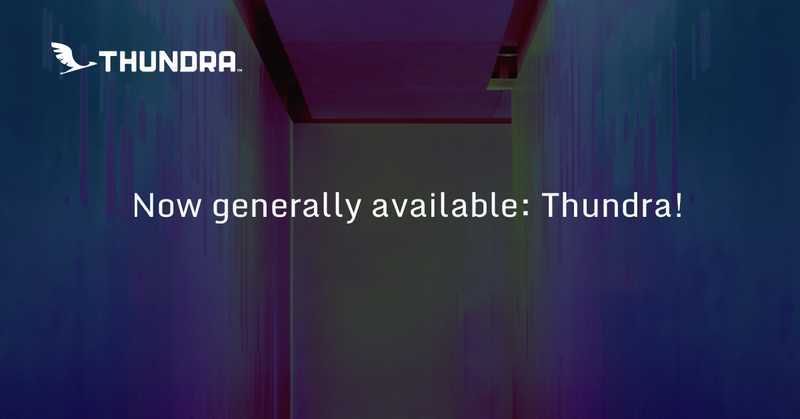 What’s new with Thundra, now that we are Generally Available? When we first started, we built a Java agent its advanced and unique tracing capabilities. For general availability, we’ve put effort into bringing our Node.js agent to advanced levels, including support for automated instrumentation. We also are supporting many integrations out-of-the-box, such as integrations with AWS SDK, databases (MySQL, PostgreSQL), Redis, and HTTP. Without any extra configuration or set up work, our integrations let you see calls, responses, and execution times for interactions with external services. We plan to continue to rapidly add new integrations. We’re releasing more than just Node.js improvements. We also improved our Python agent with support for both manual and automated instrumentation. Additionally, all of our agents (Java, Node.js and Python, Go is coming) are now OpenTracing API compatible. The advantage of being OpenTracing API compatible is that since we obey the standard, it is easy for us to integrate with other OpenTracing API-compatible frameworks and tools. In addition to making our agents OpenTracing API compatible, we also redesigned our data model to being compatible with the OpenTracing specification. This gives us the ability to integrate with other services, such as data storage layers (or even on-premises layers) so users can create their own queries and dashboards. I am so proud of what the team has accomplished and what we’ve built in Thundra. Try out our live interactive playground environment or try Thundra out with your own data and let us know what you think. We’d love your inputs and feedback to help make this solution even more amazing. I’m excited and looking forward to what’s to come. We welcome you to join on this serverless journey with us.